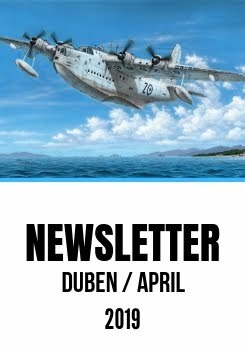 Due for May release are two initial boxings of the French SMB-2 Super Mystere, a kit Special Hobby have prepared for Azur-Frrom partner. Both these kits contain various and highly colourful French marking options, now we are happy to share with you the image of the sheets which are currently being printed in Italy. 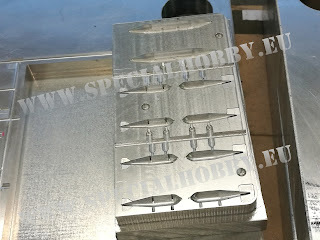 Almost finished is the last of all the project’s moulding blocks, the one containing various underwing stores, both for the original French machines and for those flown and operated by the Israeli Air Force – the latter to be released by Special Hobby towards the end of this year. 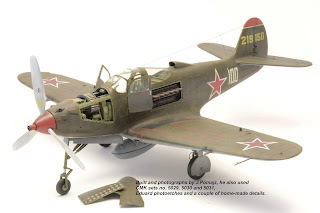 It has already been made public that Special Hobby are preparing moulds for the 1/72 Potez 25 scale model which is a joint project of Special Hobby and Azur-Frrom. 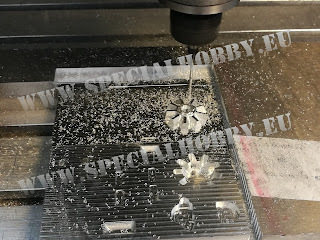 The attached photos show these moulds while being cut to shape. We have also already launched the 1/72 Vesikko Finnish submarine project, which has unfortunately been postponed for some time. Allow us a bit of artistic licence now, looking at the photos, one might say that the Vesikko’s deck moulds are emerging from their its bath of technical oil similar way the real craft was emerging from the sea at her time. Did you like the unfinished P-39N photos published here on SH blog two days ago? Well if so, we have the promised second part for you now. Enjoy! 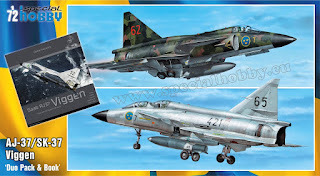 The first half of the markings for the SH72411 kit - three SK-37 Viggens + stencils.